Kauai is located in the middle of the blue Pacific Ocean. Formed some six million year ago by volcanic eruptions, it is the oldest and most northern of the eight major Hawaiian Islands. Known as the "Garden Isle" for its abundance of tropical flowers and blossoms, Kauai is also famous for its white sand beaches, spired peaks, waterfalls, and tropical rainforests making it truly one of the world's most beautiful islands. There is little wonder why it is a favorite of tourists, honeymooners, and film makers. 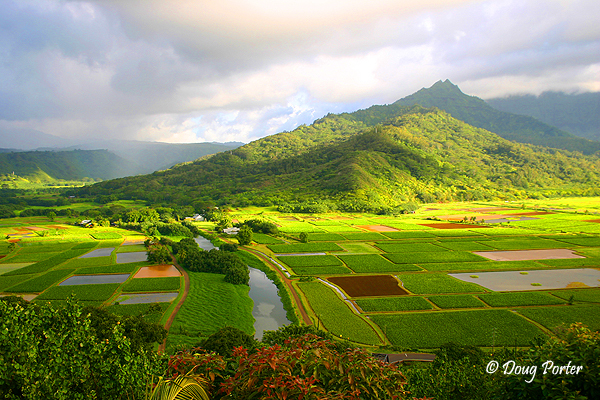 Jurassic Park, South Pacific, Raiders of the Lost Ark, King Kong, and even Fantasy Island were all filmed on Kauai. Roughly 33 miles at its longest point, and 25 miles at its shortest, the island averages 26 miles in diameter and encompasses 554 square miles. Because of its relatively old geologic age, Kauai's 90 miles of shoreline has more beaches per mile than any other Hawaiian Island. Most of the interior of the island is very mountainous. 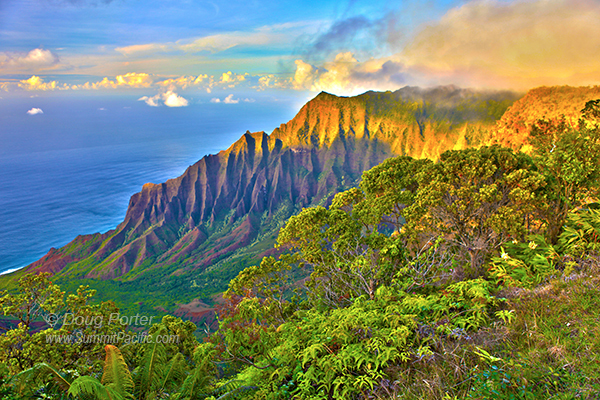 Carved with steep canyons, Mount Kawaikini (5,243 feet) and Mount Waialeale (5148 feet) are Kauai's highest points. Mount Waialeale receives an average of 480 inches (40 feet) of rain per year, making it the "wettest spot on Earth." This rain water cascades over hundreds of waterfalls, down streams and rivers as it makes its way to the ocean. The Waimea River is the state's longest at 20 miles and moves 150 million gallons of water per day into the sea. 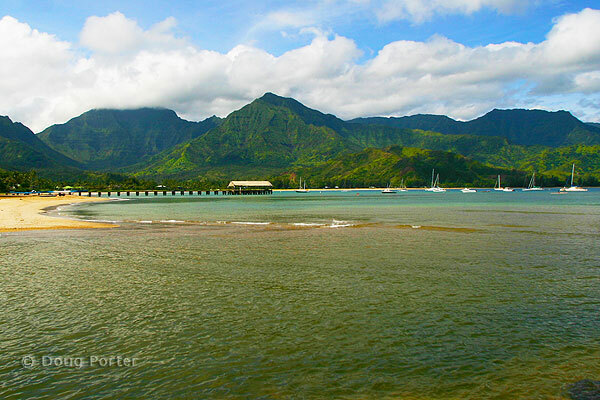 Kauai's Wailua River is the state's only navigable waterway. 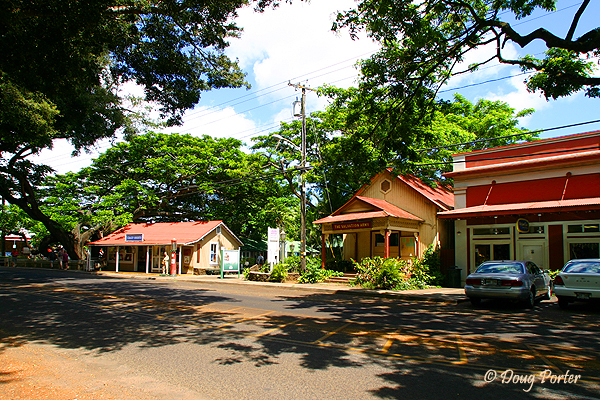 Not surprisingly, Kauai's interior is mostly uninhabited with its population of 51,000 living mostly along the shores in small towns like Lihue, Kapa'a, Koloa, Hanapepe, and Hanalei. Kauai is officially spelled Kaua`i with the backward apostrophe indicating a glottal stop (the way air stops in the expression oh-oh!). A definitive pronunciation for Kaua`i is harder to find but most sources say, "ka-wa'-ee" with the glottal stop between the wa and the ee. You'll often hear it pronounced "ka-wye'" (with the accent on the second syllable) although this would not match its official spelling. 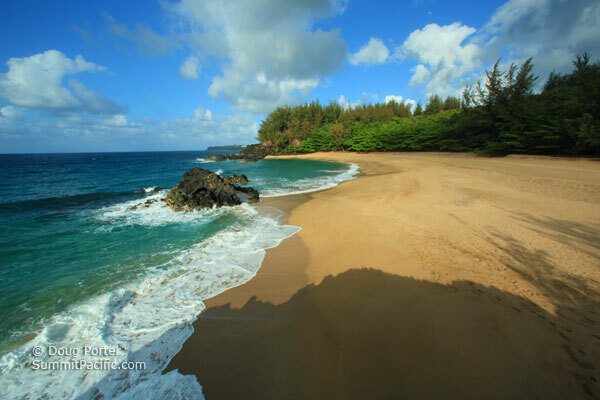 Of course, Kauai is a very popular tourist destination and the island has several hotels and an entire industry of Kauai vacation rentals condos, homes, and cottages in its coastal tourist areas including Poipu Beach, Kapa'a, Hanalei, and Princeville. Na Pali Coast: The northwest coast of Kauai is a dramatic shoreline of high sea cliffs rising up from the crashing ocean waves below. There are no roads along this 22 mile stretch of Kauai's northeast coast so access is only by a strenuous hike along an ancient Hawaiian trail. Visitors can also take boat excursions or helicopter rides to see this wilderness. Queen's Bath is a tidal pool on the north shore that although beautiful and tempting to swimmers, is infamous for drownings and accidents. If you must swim here, do it in summer months at low tide. In winter months and times of high surf, waves and strong currents can carry swimmers out to sea. Kilauea Lighthouse is one of Kauai's most visited attraction. It was built in 1913 to guide ships and had the largest glass lens in the world. It was decommissioned in the 1970s and the light was replaced with a low cost beacon. The peninsular bluff it sits on has been set aside as a bird wildlife refuge and home to large number of ground nesting seabirds including Wedge-tailed Shearwaters and Great Frigates. Shipwreck Beach takes its name from an old wooden shipwreck that surfaces now and again from the depths of the sand. Uncovered and then buried again by high surf, the 100+ foot long ship hasn't been seen since 1982. The cliffs on the north end of the beach are actually petrified sand dunes and provide a stunning backdrop to the beach. Besides being culturally significant, the cliffs were also the location of a famous lover's leap in the movie "6 Days and 7 Nights." 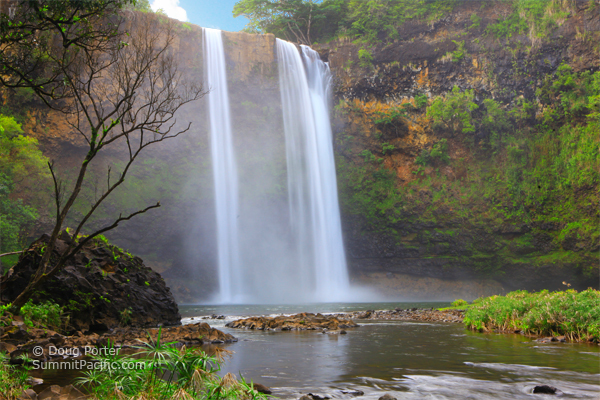 Wailua Falls: Ancient Kauaiians jumped off of this 80 foot waterfall to prove their bravery. In slightly more recent times, this beautiful double waterfall was featured in the opening credits of the TV show Fantasy Island. It's still a popular attraction today and visitors and photographers can drive to an overlook on the side of the road to see it. 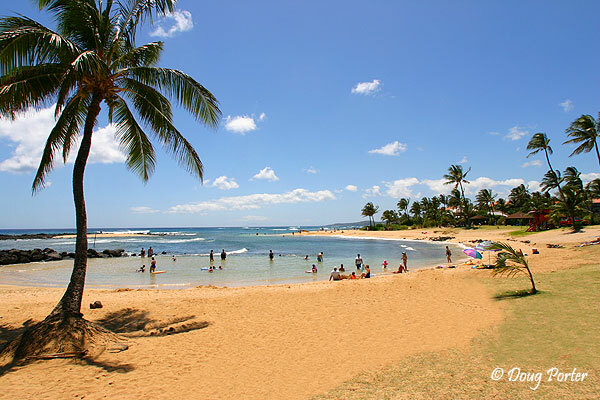 Poipu Beach on the south shore of Kauai is often lauded as America's Best Beach. There are many reasons why you'll agree. Perhaps it's the sunny south shore weather, the clean golden sand, the protected baby beach, the adjacent park and playground, maybe or maybe it's all of this and more. Tunnels Beach. There are so many extraordinary north shore beaches that picking a favorite is hard, but Tunnels is definitely high on everyone's list. Named after the underwater corral features that make it a wonderland for snorkeling and for the surf formations beyond the reef that make it a favorite for surfing this beach is just downright spectacular. Map of Kauai. 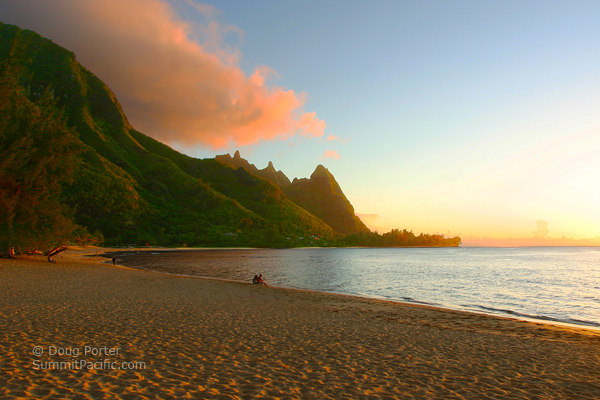 There are many other extraordinary must-see Kauai beaches and attractions on the island. 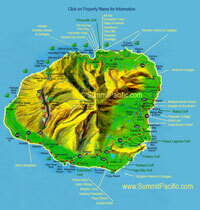 Please study this Map of Kauai for more information and to see the relative locations of many other important landmarks and accommodation locations.